The raw lime stone is first screened & washed to remove undesized material and then it is fed to the vertical shaft lime kiln for preheating, calcinations & cooling operation. 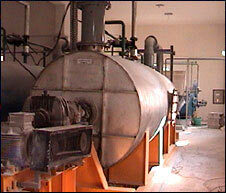 Here process is controlled automatically and quick lime & CO2 gas are obtained. Then quick lime is hydrated with process water in batch reactor and screened to remove lime impurity. 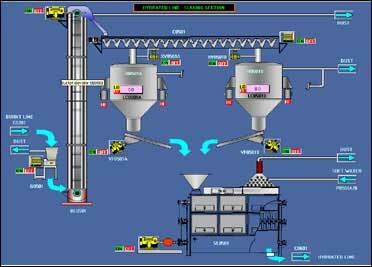 The line slurry is then further processed to reach at designed process conditions, required in reactor for carbonation. 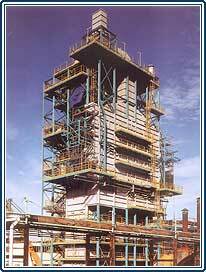 The CO2 gas from lime kiln is cooled and washed in a vertical washer and then it is charged to the batch reactor. The required conditions are maintained in reactor to obtain different grade of precipitated calcium carbonate. This slurry is further washed, filtered and dried to get fine powder of precipitated calcium carbonate. It is used as filler & coating pigment for premium quality paper products. PCC improves optical properties and print characterized of paper products, improves paper machine productivity & reduces paper making costs through the replacement of more expensive Pulp fiber & optical brightening agent. PCC also finds many industrial uses, based on the ability to achieve small particle size and special crystal shapes. In rigid PVC, such as vinyl siding and fencing, PCC increases impact strength, with some of the smaller parcticles able to replace expensive impact modifiers. Nano PCCs (less than 0.1 micron in size) control viscosity and sag in automotive and construction sealants, such as PVC plastisols, polysulfides, urethanes and silicones. In paint, PCC?s unique particle shapes improve hiding and allow reductions in titanium dioxide levels. An Effective acid neutralizer, PCC is often used in calcium-based antacid tablets and liquids. Being high in calcium content, PCC enables the formulation of high dosage calcium supplements and multi-vitamin/mineral tablets. The small particle sizes and special particle shape contribute to the development of good tasting calcium fortified. In paint, which is another important applications, calcium carbonate has now established its self as the main extender. Fineness and particle-size distribution determine the opacity. Moreover, calcium carbonate offers interesting properties as regard to weather resistance, low abrasiveness, low electrolyte content, pH stabilizing effect, and improved anti-corrosion and rheological properties of coatings. 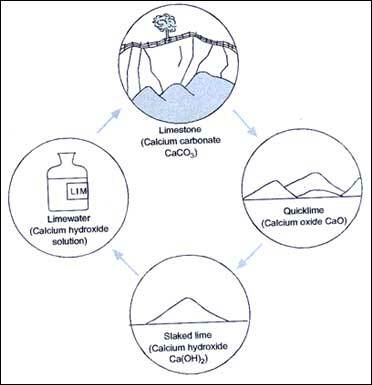 Calcium carbonate is also important in water-based system, in which it contributes to the shortening of the drying time with - for example - important implications in road - line markings. Burning of Limestone into vertical shaft lime Kiln to give quick lime. Reaction of quick lime with water. Limestone is burned in a mechanically designed vertical shaft kiln to produce the desired quality to quick lime & CO2 gas. Quick lime of desired lump size is cooled and then transferred in to a hammer mill for crushing. After crushing, quicklime is hydrated in the slaker / reactor by adding a controlled quantity of water to yield the hydrated lime with desired purity. This slaked lime is then stored in a big silo for providing some holding time and then classified in air classifier to obtain fine hydrated lime. Continuous operation, easy to operate, low cost. 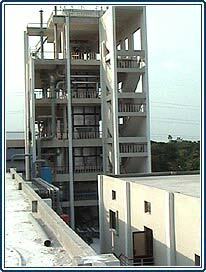 Clean working environment by adopting wet & dry pollution control scheme. In Pre treatment section, lime stone is screened to remove undersize & washed in rotary screen by using water to remove impurities like dust, dirt, mud etc. These impurities are separated out in a settler and clear water is reused for washing. The washed Lime Kiln is then charged to the vertical lime kiln from top through the winch arrangement. In this zone, lime stone is preheated up to a certain temperature by using heat from hot exhaust gases (CO2) of lime kiln. Lime stone is then entered in to a calcining / reaction zone of lime kiln. Here, the temperature is controlled near about 1100-1200°C by burning the fuel (Natural gas/fuel oil) & combustion air mixture in a controlled ratio. The total air requirement is fulfilled by two stage air feeding system, primary air for fuel burning in burner and secondary air for recirculation inside chamber. To gain a better efficiency of lime kiln, the re-circulation air is preheated up to a certain temperature in a heat recovery system. Here secondary air is heated up by the heat of hot air, obtained during cooling of burnt/quick lime from lime kiln bottom. The cooled quick lime obtained from lime kiln is then transferred to storage area. Wide range of product grade.